People always say, “You travel all the time” and “Are you ever at home?” to me. I lived in my condo in Miami for six months before I ever saw my neighbor across the hall. She said, “Oh wow, you do exist after all!” For as much as a travel, though, it rarely ever is just for me. Don’t get me wrong–traveling to cover sports is an absolute dream come true. Yet, even though it doesn’t feel like work, at the end of the day doing so is work. There are commitments and deadlines and meetings. And little time for me. 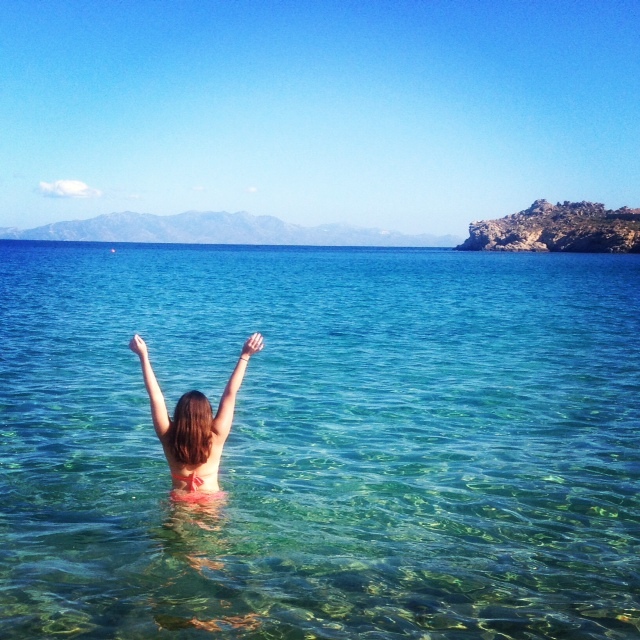 Greece, though, was for me. Going there was one selfish wish that I wanted to fulfill before I turned 30. It was one place that when I spun the globe around, my fingertips always landed on. Greece was a place I needed to go. A place I needed to see. Somewhere I had to get my hands on and wrap my heart around. 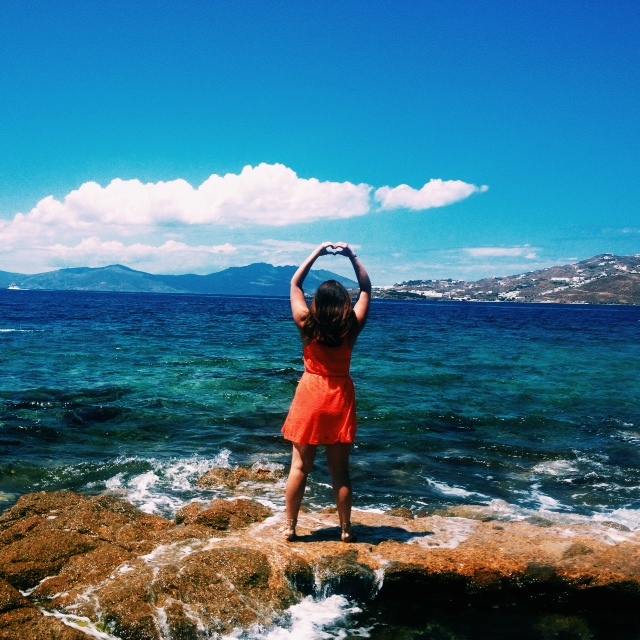 Greece, for me, was a dream come true. Over Christmas when I was home in Denver, one of my best friends from college and sorority sisters, Alli, told me about her goal to travel internationally every year. I told her how awesome I thought that goal was and said I really wanted to go to Greece as a 30th birthday gift of sorts to myself. She said she always wanted to go there. The next thing I knew, we were booking flights, looking at hotels and mapping out our trip. 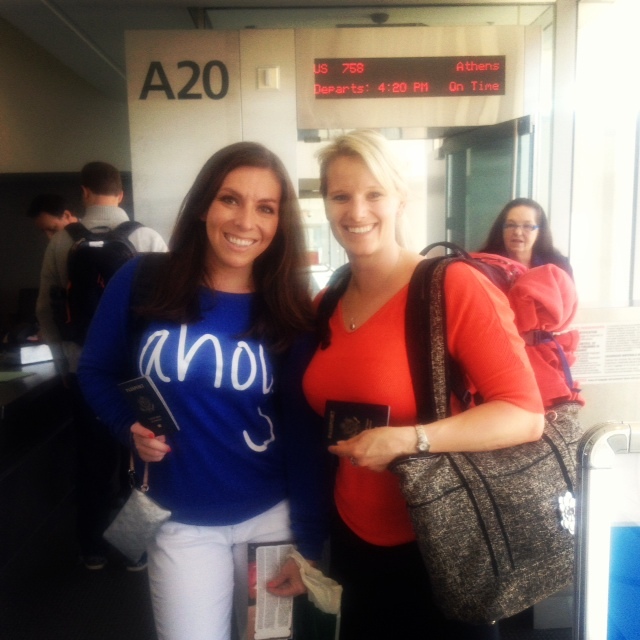 Passports in hand and ready to say goodbye to the U.S.! After reading guidebooks and travel websites, we settled on 12 days in late May/early June. This would be right before the islands’ busy season, but late enough that the weather was warm. We began our trip by flying into Athens–and promptly leaving Athens. We arrived there at 9 a.m. after an overnight flight from Philadelphia. 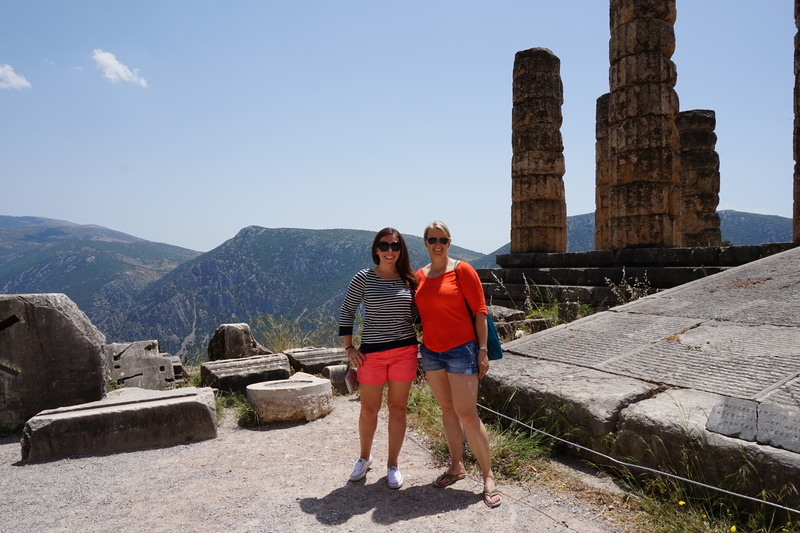 After getting our rental car, we headed north to Delphi. In Delphi, we stood on a plot of land that the 6th century Greeks believed to be the center of the world. We saw architectural designs of stone plotted on a mountain that have stood the test of time and the attempted sacks by men. We saw a place that was an ancient proclamation of my belief that “sports can change the world,” as the Greeks hosted the Pythian Games in a period of time before Christ was born. We saw a place in this world that was so ancient, yet held within it so many of the dreams that I myself hold today. The center of the world? The center of the world. 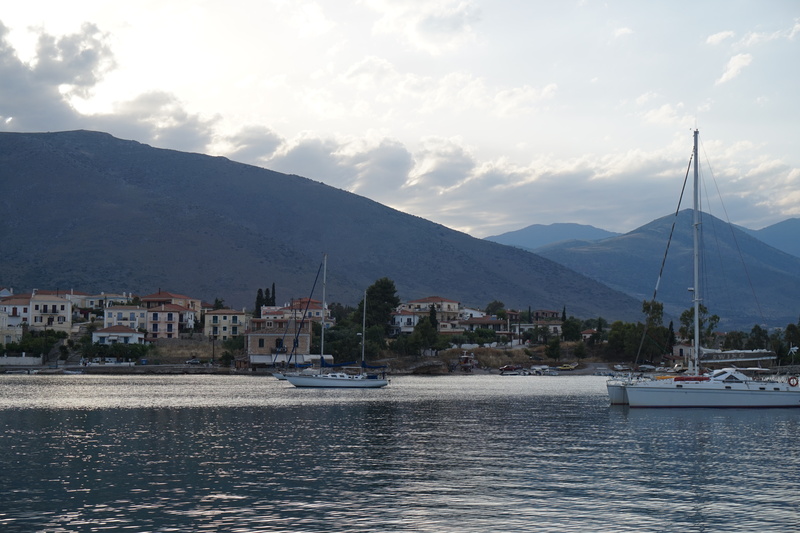 Instead of staying the night in Delphi, my meticulous combing of travel websites led us about 30 minutes away to Galixidi for the night. If I ever have a breakdown and disappear, I suggest that everyone look for me first in Galixidi. Seriously, this might be the most perfectly relaxing and quaint place in the world. 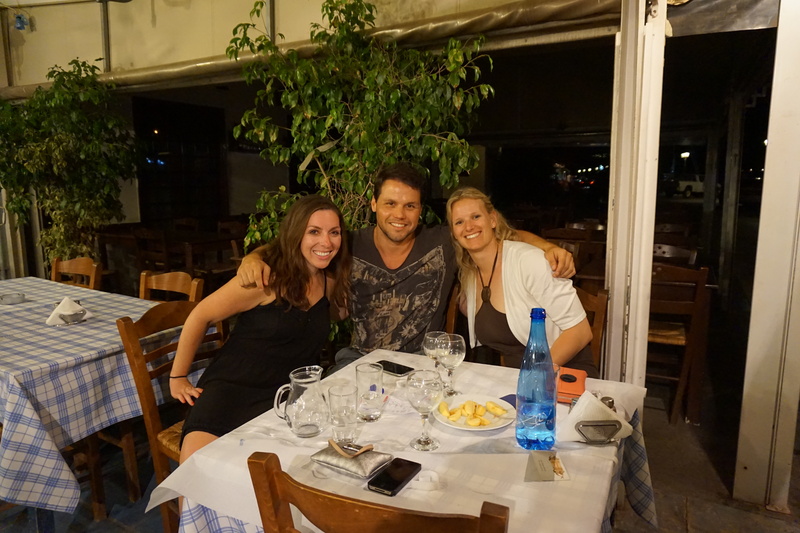 And to top it off, Alli and I pretty much had Galixidi to ourselves. Galixidi is located on the north coast of the Gulf of Corinth. After checking into our hotel, Alli and I went for a walk around the gulf and spotted a beach bar. As we began downing cheap beers (ever had a Fix? Yea, I’ll probably never have one again) under our umbrella at the foot of the gulf, we were the only people at the bar, save for the bartender. A perfect afternoon at a perfect beach bar. Later, a local, Cristoph, would arrive for some afternoon sun. With saltwater hair and sun-soaked skin, we chatted up Cristoph, ended up befriending him, and had dinner and drinks with him later that night. What he symbolized to me, was the extreme friendliness of the Greeks. They were all so kind, welcoming and engaging with us. I can’t imagine in the United States ever just meeting someone, befriending them and making it a point to meet them for dinner. It was refreshing and welcomed. Galixidi was amazing, but it was time to move on. We next headed four hours away to Meteora. A UNESCO World Heritage site, Meteora means “in the heavens above.” And I think that is an apt name. Meteora is a mountainous area, reminiscent of Colorado or Utah. As you approach the mountains, though, you see these pillars of rock believed to be over 60 million years old. 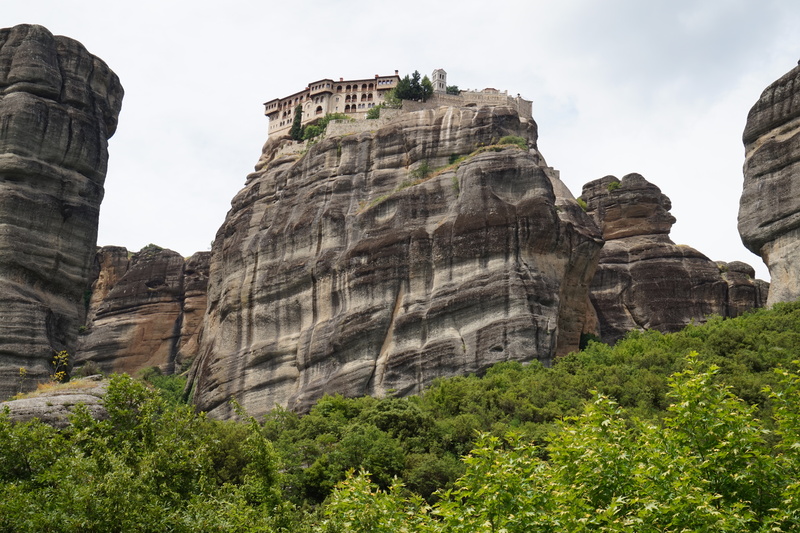 During the 14th century, monks began building monasteries on top of the rocks. Fearful of the Turks’ invasion, the monks’ architectural genius and commitment cannot be understated. There were no roads. There were no bulldozers or modern machinery. There were, though, hands, manpower and tough mindsets. From those things, some of the most amazing and beautiful architectural feats I have ever laid my eyes on were built. And within them was placed innate art, gold and other expressions serving as testaments to a belief in something bigger than man himself. Inside of the monasteries, held a place where I not only had to catch my breath, but a place where I was reminded in my faith that indeed, there is something greater than all of us out there. 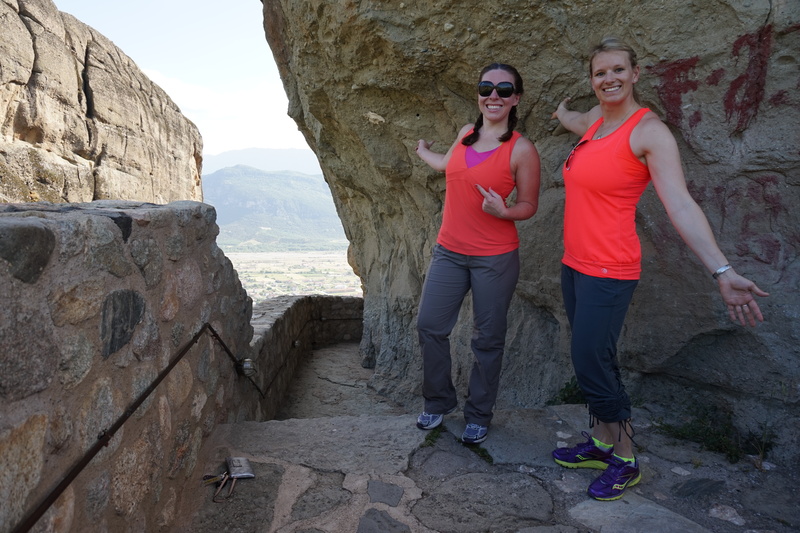 I also wore hiking pants in Meteora. A first, and probably last, for me. The next morning, we headed back to Athens to spend the day there. Athens was insane. Nuts. Chaotic. Crazy. It’d be too soon before I ever had to go there again. I’ve lived in southern California and Miami, but the driving in Athens was unlike anything I have ever seen. There were cars and tall buildings everywhere and bicyclists and pedestrians just tossing themselves about in traffic. It was a stressful scene. Luckily for me, though, Alli drove our rental car throughout Athens. Amazingly, we didn’t get lost and even found free and close parking to the Acropolis, which was our main reason for being in Athens. Before heading to the Acropolis, we stopped for a quick bite and some sangria. We then walked about 10 minutes and reached the Acropolis. Little do you know, that all hell is breaking loose around the Acropolis. I feel bad for saying this, but I wish I was more moved by the Acropolis. Perhaps it’s because I was on my third day of visiting historical architectural sites that I wasn’t wowed by it, or maybe it was the large group of tourists, or even the rampant construction taking place at the site. I’m not sure what it was, but I didn’t walk away with any life-changing sentiments or “aha” moments. I did come away with some cool pictures, though. My favorite one is probably the one right below, where Alli and I look so stoic. What this picture doesn’t show, is how right before it was snapped we were attempting to take a funny picture, where we were holding our hands up like columns. 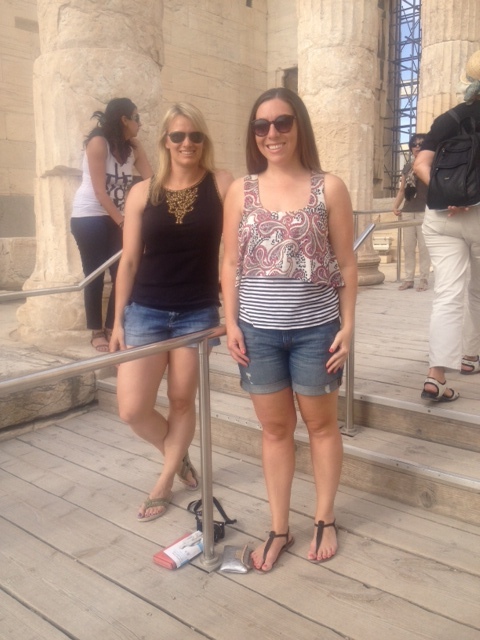 However, an Acropolis guard was less than amused and yelled at us that we can “only take normal pictures!” Buzzkill. Yet, we obliged. 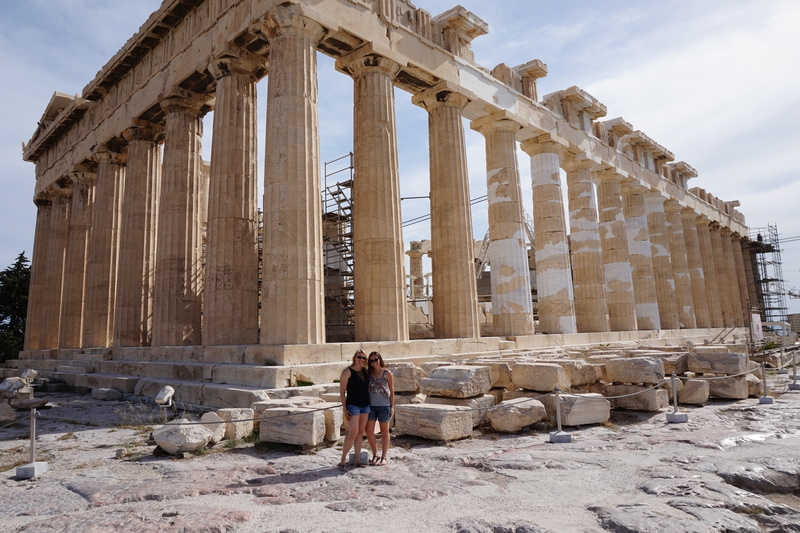 And now have one very awesome, normal picture of us at the Acropolis. I look scared. The next morning, we flew to Mykonos. 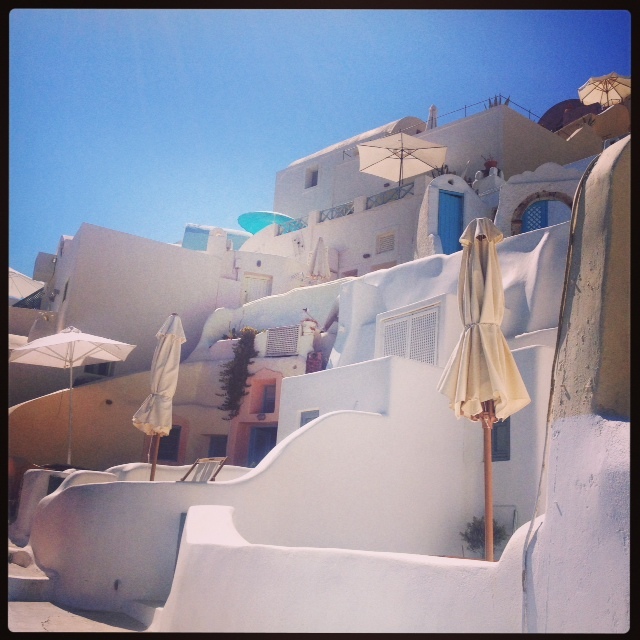 When we landed in Mykonos and exited the airport, I thought I made a horrible travel decision. 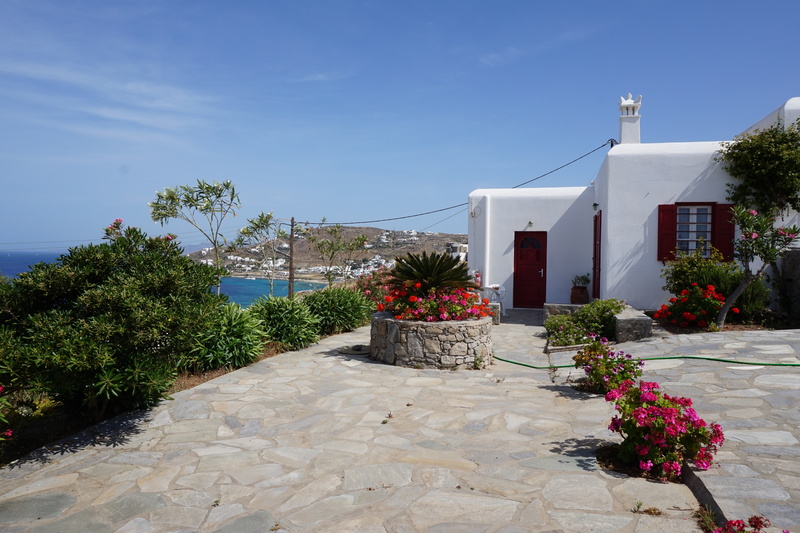 All of the pictures I had seen of Mykonos showed beautiful, crystal blue water and white, frescoed buildings. All I saw was dry, desolate land. Honestly, I hated Mykonos the first eight hours I was there. Later, it’d become my favorite spot we visited. Celebrating the fact that the pictures were right. 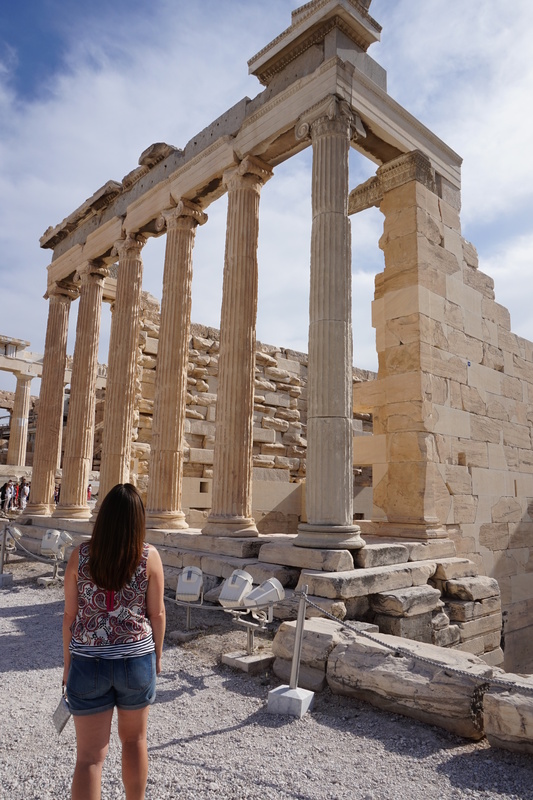 Alli wanted a more “authentic” travel experience in Greece. Whereas I would’ve probably rented a room at a hoity-toity resort, Alli wanted to engage and interact with Greek people and understand their culture. I’m glad she desired this, because it led to us meeting some amazing people. We used Airbnb and rented a cute studio in Ornos that overlooked the water. The owner of the studio’s father, Mimis, picked us up from the airport as the owner was in Athens to vote in the Greek election. Mimis was wrinkled, yet tanned, and spoke no English whatsoever. At the airport, he held up a sign reading “Jessop,” so we approached him, got into his car and then proceeded to say nothing at all to each other. Later, I’d remark to Alli that we sure were being ultra trusting of complete strangers. She brushed it off. Mimis took us to a rental car company where Alli and I initially rented a sedan. After driving that around for about 45 minutes, Alli made an executive decision that we were returning the car and getting scooters to transport ourselves around the island. If there is one thing my mom taught me about traveling with others, it is to go with the flow. Sometimes you have to do things you don’t want to do. Sometimes you have to go out on a limb. Sometimes you have to compromise. In swapping out the rental car for a motorcycle for Alli and an ATV for me, I was doing all three. I have never operated a motorized bike before, and in all honesty, was pretty frightened to do so, especially in a place I was unfamiliar with. For as much as I know about sports, in the end, I’m a girly girl. I love shopping and nail polish and don’t mind letting men take the lead. Riding a motorized bike is about the antithesis of Alicia as it gets and I was vocally freaked out about it. I get lost easily, am not good with directions and am not the most coordinated person. Upon learning that I drove a rental car in Greece, my friends who know and have driven with me were mortified. 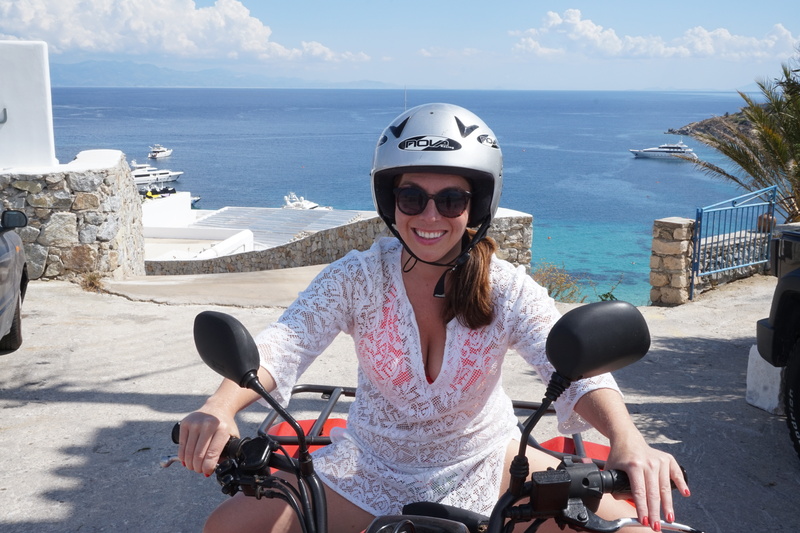 They were even more shocked to learn that I cruised around for four days in Greece on an ATV. Most were surprised that I lived to tell about it. In the end, though, renting the ATV ended up being one of my favorite parts of our trip. 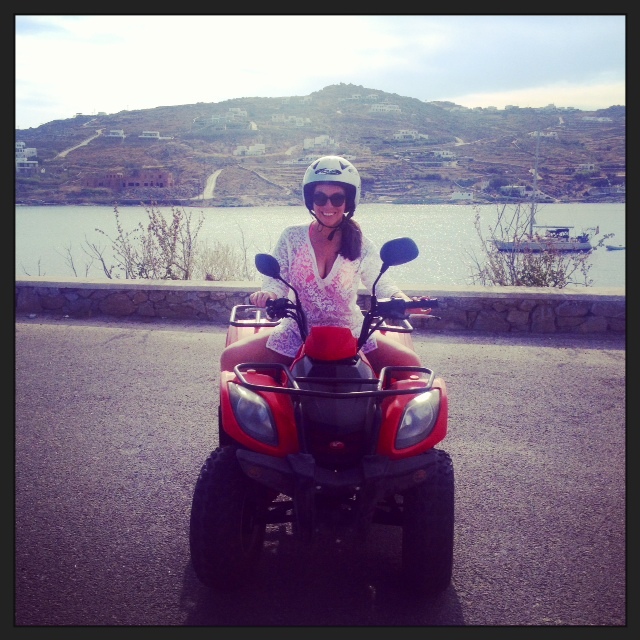 Cruising around the island on that little ATV in my bikini and feeling the air blow through my hair was such a freeing experience. I felt young and alive. I felt like I could do anything and that the world was at those fingertips wrapped so tightly around two handlebars. Seriously, though, I gripped those suckers so tight that I may have developed early onset Carpal Tunnel Syndrome. It hurt. Bad. 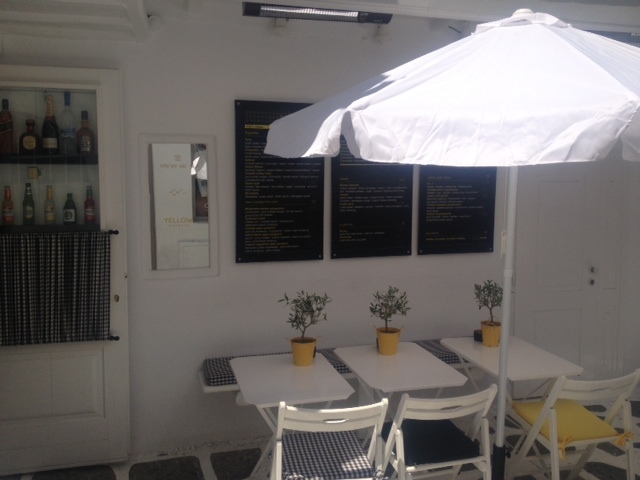 The reason Mykonos became my favorite spot of all we visited during our trip, was because to me, Mykonos symbolized fun. Every day we were there, Alli and I visited a different beach. Every beach had beach bars with cabana beds that you could lie on and order drinks from. Loud music emenated and there was laughter everywhere. It was great. So great. My favorite day there was the day we visited Super Paradise Beach. I thought this beach and its water were so beautiful. The people were so fun. 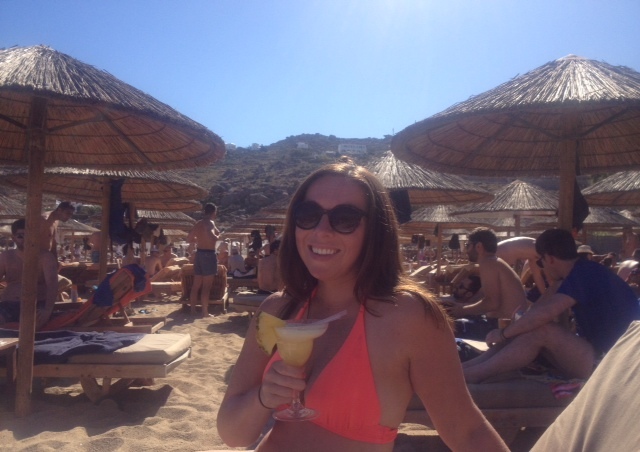 Alli and I spent the bulk of the day ordering foo-foo drinks from a happy Grecian beach bartender. We befriended a group of guys from Germany when I accidentally knocked my entire pina colada into Alli’s motorcycle helmet and one jumped up to clean it off. The world felt small being around these people. It felt like I could go anywhere, do anything and befriend anyone. It was welcomed. Even if it took sacrificing a $15 drink. 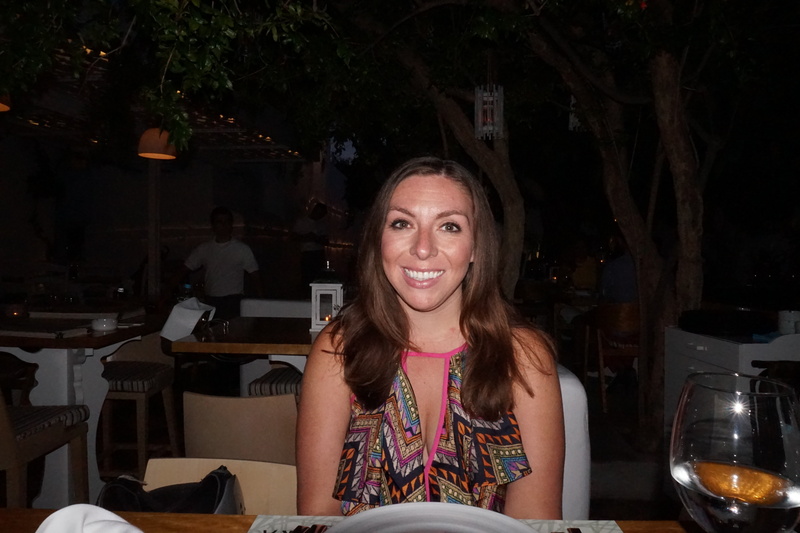 Alli and I ate very well in Mykonos, as we did throughout the rest of our trip. Every night we would go into Chora, or Mykonos Town, for dinner. I ate linguini with lobster and fresh fish. I drank good wine and had good cocktails. 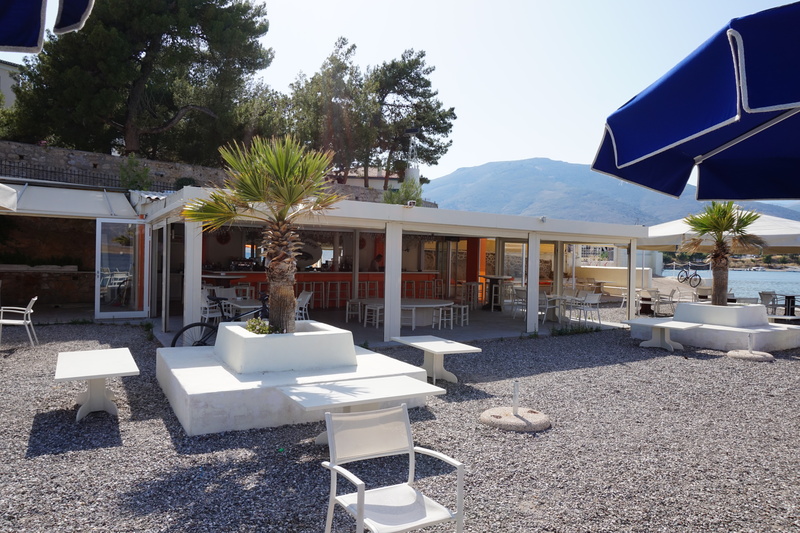 Sitting under the Mykonian sky that was perfectly painted midnight blue and dotted with bright green palm trees while dining on fresh fish at Mamalouka will be something I always remember. Dining under the sky at Mamalouka. During the days we’d visit Chora, I’d pop into Yellow. An aesthetically pleasing coffee shop whose sign read “foodies spot,” made me know I was at home. There, I’d chat with the barista and order up Nutella crepes and wish I never had to leave. The perfectly pleasing patio of Yellow. Then there was the day that Alli and I perched up on a bar patio, sipping sangria, as we waited out the rain in Mykonos. As we talked and laughed, a cat appeared. 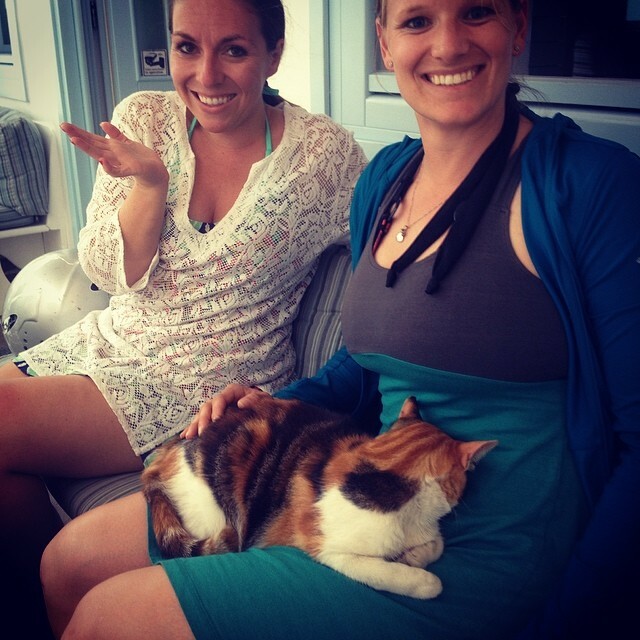 If you’ve ever been to Greece, you know there are cats. And dogs. Everywhere. None of them really have a home; they just wander. This cat, though, had a home. We watched it walk out of the door of the house across from where we were sitting. It proceeded to call Alli’s lap its new home. It sat there for hours and purred and purred as we drank and waited on. Our waitress walked by and said, “Oh, that’s Boo Boo,” as if it was nothing that this animal was sitting on a stranger’s lap. I liked Boo Boo, because Boo Boo was unafraid. In a town with frescoed buildings, high-end stores and exquisite cuisine, Boo Boo wasn’t afraid to approach someone and make them his own. The rain that night, gave me one of the greatest gifts of my life. 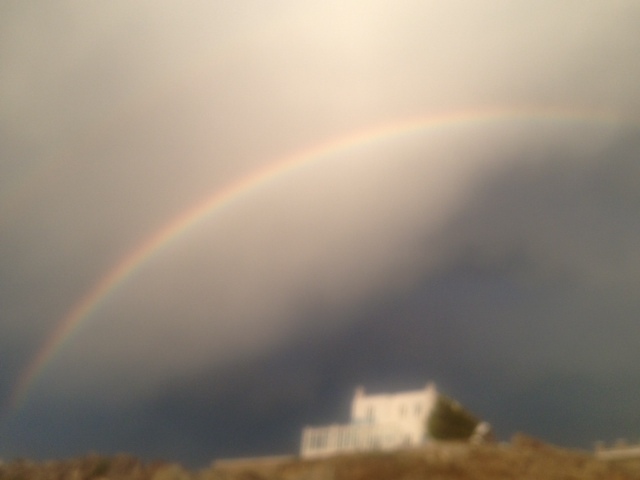 As Alli and I rode back to our house around Mykonos’ winding turns, I spotted a rainbow. As we continued on, I slowly realized that the rainbow stretched across the entire island. As we got further, I saw that there was not one, but two rainbows. Yes, a magical, mythical double rainbow laid stretched out before me across the island of Mykonos. We pulled over on the side of the road and as we were snapping pictures of this wonder, I couldn’t help but thank God. I thanked Him for bringing me to Mykonos. For showing me this sight. For His redemption. For Him dragging me out of one of my lowest points of my life, where nothing made sense, and presenting me with this gift. Upon seeing it, everything made sense. I’ll never forget those rainbows for as long as I live. They were life changing. iPhone cameras can’t capture double rainbows. Apparently Steve Jobs was human, after all. 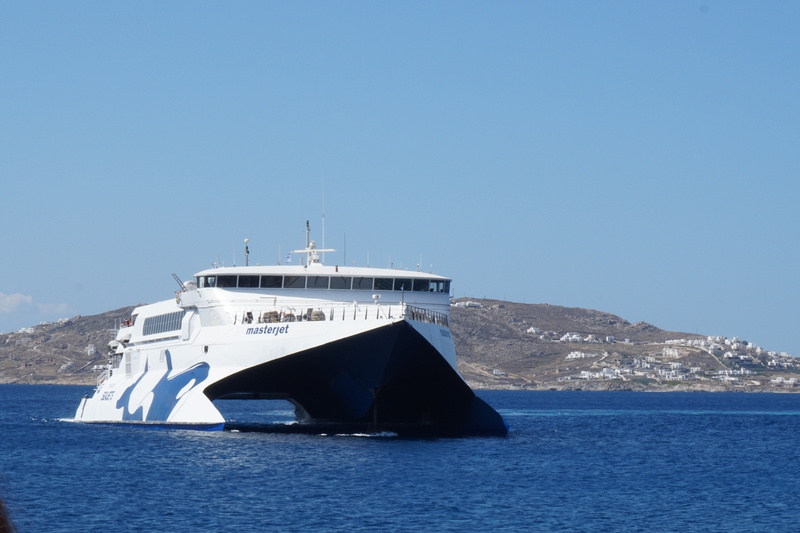 After three nights in Mykonos, we were off via a ferry to Santorini. I read a lot about the ferries in Greece being unreliable, and as luck would have it, we had a chance to experience this for ourselves. Mimis dropped us off at the port about 30 minutes ahead of our scheduled ferry departure time. I’m not a morning person, so this was already too early for me. There was nobody at the ticket counter, and only other tourists swarming about wondering if they were in the right spot. We waited and waited and over an hour after our ferry was scheduled to leave, a big boat rolled in. We entered and I immediately did whatever I do when I travel via common carrier: Fell asleep. Some four hours later, we arrived in Santorini. The one thing Master Jet has mastered, is the art of keeping people on their feet. And running late. 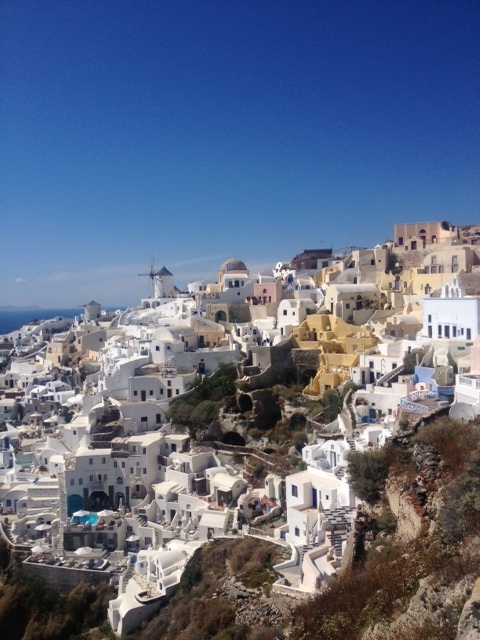 Santorini was heaven, bliss, a dream come true. 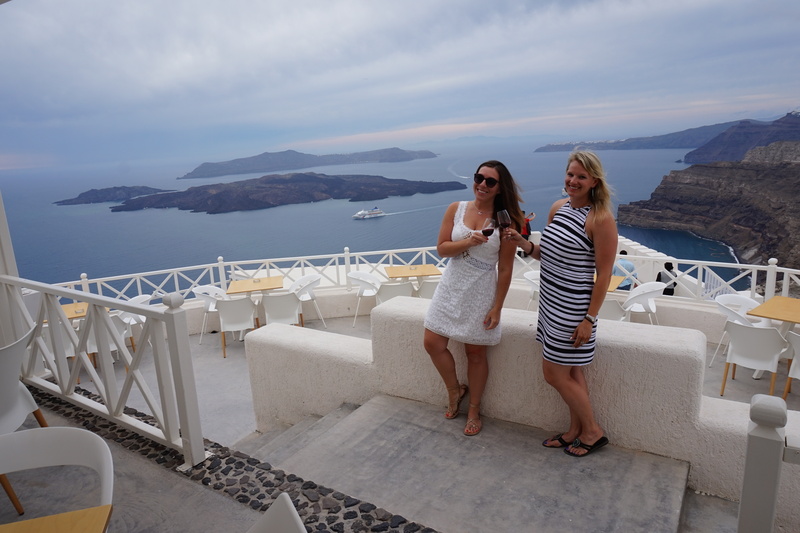 While traveling with Alli was great, I would’ve preferred to be in Santorini with a man. A lover. Ok, a male lover. Santorini has romance written all over it. Everywhere you look on the island, there is a view that makes you catch your breath. 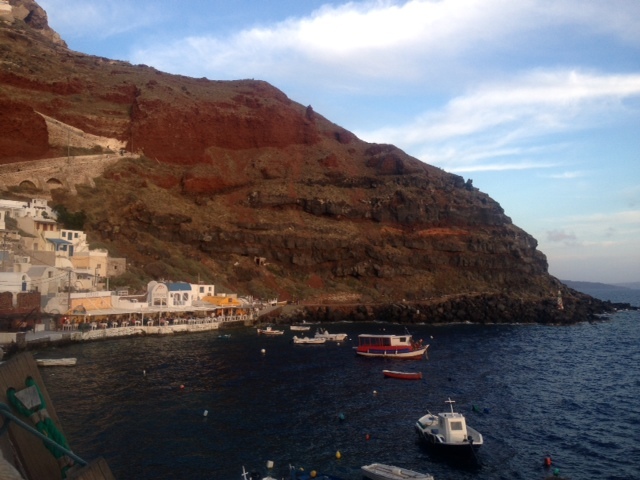 We stayed in Oia, on the west end of the island, which is known for its stunning sunsets. We rented a cave house facing the caldera from a woman named Maria, who as we would later find out, is legendary around the island. The sweet woman would later have us over to her home, below the “Oia Castle,” serve us Vinsanto (more on that later) and give us each a handmade doilie. Oia and Maria’s cave house ended up being the perfect place to call home. From there, we were able to walk to shops and restaurants and down hundreds of stairs to the bottom of the cliff where the sea meets the sand. At the end of that cliff, we’d have one of our best meals of the trip. 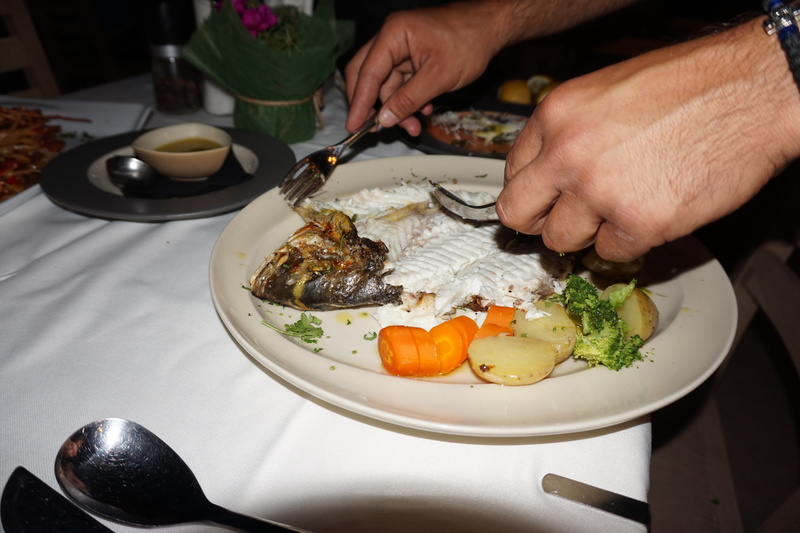 The waiters took a liking to us and walked us over to check out the fresh catches of the day. I picked a lobster for my second round of lobster on linguini of the trip. Alli picked an indigenous fish. 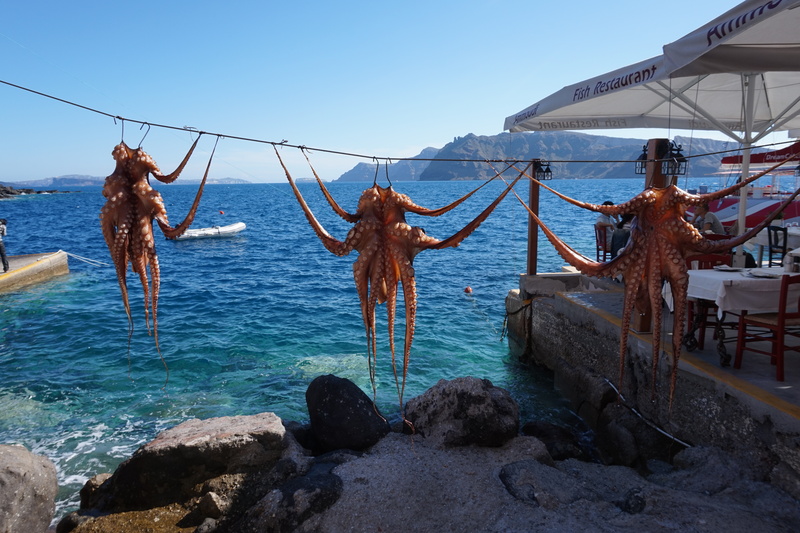 We passed on the freshly caught octopus. When our meals were cooked, we were greeted with one of the most beautifully presented meals I’ve ever seen. Two waiters approached our table and proceeded to take my lobster out of its shell and prepare Alli’s fish. It was an amazing experience. A pretty alright dinner view. The rest of our visit in Santorini was filled with a day of wine tasting, where I learned of my deep love for Vinsanto (I may have had it with every meal for the rest of our trip after I discovered it), a really windy trip to the red and black beaches, a relaxing, sunny day at the black beach and an amazing three course dinner at the famed 1800. It was magical. Drinking Vinsanto at the Vinsanto Winery. Go figure. Get a load of that view, though! With firsthand knowledge of the inconsistency of Greek ferries, we were happy that we opted to fly from Santorini to Athens for the last night of our trip. By this point of the trip, I was having Starbucks withdrawals (I went without for 12 days, which is HUGE for anyone who has spent more than 18 hours with me). I was also missing the convenience of being able to flush toilet paper down the toilet and not having to turn on the water heater 10 minutes before you wanted to take a shower. As such, I was THRILLED that we booked a Hilton for our last night in Greece. The Hilton in Athens was absolutely amazing. Along with having plush beds and readily warm showers, it had one of the most perfect views of the Acropolis. 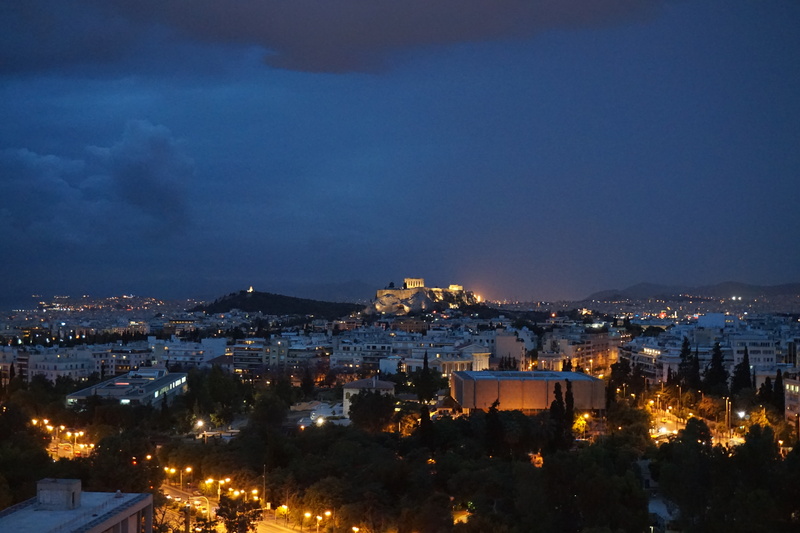 I saw amazing pictures of the Acropolis lit up at night, and luckily, the view of it from the Hilton didn’t disappoint. Alli and I sat on the terrace and drank champagne as we watched the sun go down, but the Acropolis light up. It was something I’ll never forget. We sat there largely quiet, both of us reflecting on the journey we had just been on. For me, that reflection was centered largely around gratitude. Gratitude for the ability and means to take this trip. Gratitude to have a friend to go on it with me. Gratitude for new friends made and experiences bourn. Gratitude for nearly 30 years that preceded it and the twists and turns that brought me here. Greece was magical. It was all that I wanted to be. Greece was for me.